The old Palau Blaugrana 2, known as ‘el Picadero’, was transformed in 2013 into the new Social Offices and the Auditori 1899. The idea was to provide a better service and do so in an enjoyable and historic setting. The building, which has maintained the previous structure and materials, is a combination of functionality, aesthetics and integration in the neighbourhood , located on the south corner of the junction between Travessera de les Corts and Arístides Maillol. 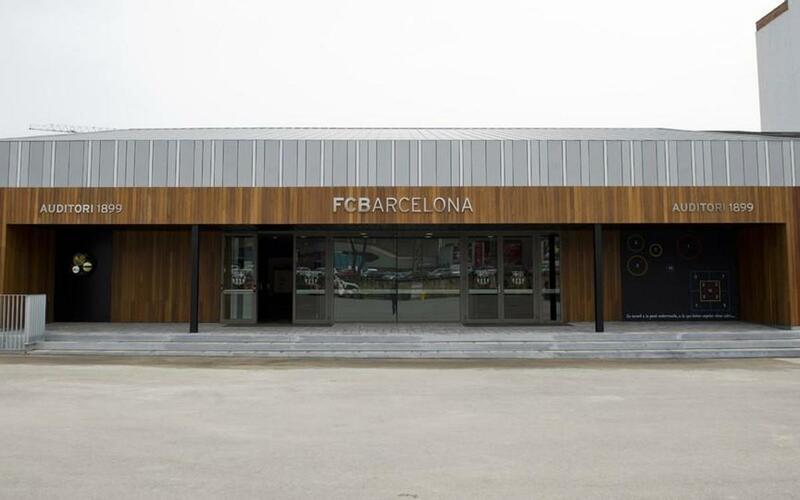 The Social Offices consist of the Barcelona Supporter Services Office (OAB), The Supporters Club Services Office (OAP), The Specialised Care Office (OAE), a centre for collecting passes, a cafeteria with a meeting point and an underground store with a locker room area. The space is also used by the club’s new travel agency and the Ombudsman’s Office. One of the most emblematic features of the project was the Auditori 1899, a multi-purpose venue with the capacity for 600 people and 650 square metres for hosting large-format events. Each space had its own air-conditioning and lighting system, including a soundproofed audio studio and simultaneous translation booths. The entrance includes reminders of the venue’s previous use and there are views of the Camp Nou from inside. When not being used by the club, the space can also be hired by companies, something that has helped to cover the costs in just a matter of years. The work covers a total site area of 4,000 square metres on two floor, all of which was designed with environmental and sustainability issues in mind, as well as ensuring accessibility for persons with reduced mobility. The basement is used for storage and locker rooms, thus centralising the storage space at the Camp Nou. The project arose from the need for the Social Area to have a suitable home, while also expanding the club store. Designed by the architect Albert Blanch, the work took six months and cost 2.7 million euros, and reflects a sentimental project that has respected the historic structure while also being a stunning example of modern architectonics. Thanks to the new Social Offices and Auditori 1899, FC Barcelona now enjoys a brand new facility and a new connection with Les Corts neighbourhood (Access 15A), offering a public space and refitted facades and pavements.